With its soaring 22-story atrium lobby and its famous blue dome, Hyatt Regency Atlanta has been a landmark in Atlanta for over 35 years. The rooms are among the best in Atlanta thanks to a recent $22 million renovation. Amenities include two restaurants, two lounges, and a fitness center featuring Stay Fit at Hyatt with brand new, state-of-the-art equipment. Hyatt Regency Atlanta features more meeting space than other hotel in Atlanta, and Centennial Ballroom is the largest hotel ballroom in the state of Georgia. With newly renovated guest rooms, flexible meeting space and world class service, Hyatt Regency Atlanta is one of the city's premier hotels. Located on Peachtree Street, the hotel features convenient access to numerous business and cultural destinations and is within walking distance to Georgia Aquarium, CNN Center, World of Coca Cola, Phillips Arena, Georgia Dome and more. Hyatt Regency Atlanta is attached to Peachtree Center Mall via indoor skywalk, which allows easy access to MARTA, Atlanta's rapid rail transportation system, and a variety of shops and restaurants. 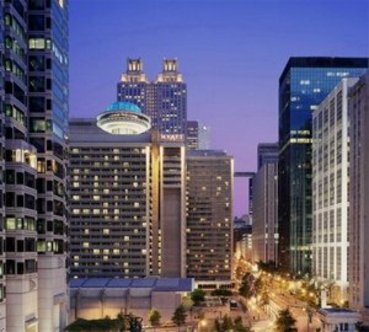 Hyatt Regency Atlanta recently renovated its guest rooms, giving the hotel the best and newest hotels in downtown Atlanta. Guest rooms feature the Hyatt Grand Bed, Wi-Fi internet access, oversized mobile work stations, TV with remote control, cordless phone with voicemail, audio/video check-out, electronic door locks, Portico bath amenities, turndown available on request, iron with ironing board and hairdryer.Whether for business or for leisure, Hyatt Regency Atlanta offers the very best for your stay in Atlanta.Valet Parking is $24USD overnight.